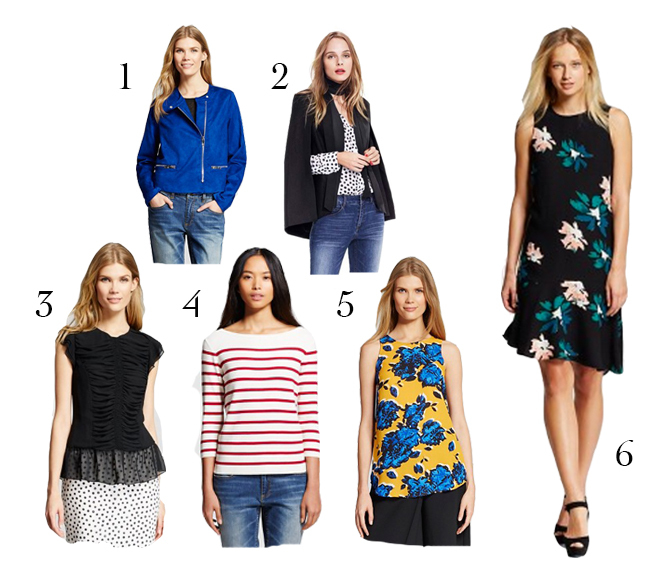 The Who What Wear for Target collection was officially released today! It was inspired by street style and I love so many of these pieces. I think it's a perfect mix of classic and trendy, and everything is under $50! They also had the bright idea to restock when things sell out (looking at you, Lilly...). I didn't check the website until about 9:30am today and lots of it was sold out online, but I think they have restocked it all there since then. I stopped by my local Target after church today and they had just about everything available, I left with this top! If you're reading this on Sunday or early Monday, I shared some of what I tried on via my new blog snapchat: caralinastyle. And here are some of my favorite pieces from this chic and affordable collection! I've been really into handbags lately. I used to get one good quality neutral bag that would go with everything, and I would get a new one when I got tired of that one, and I didn't really carry them that often in college. But over the last few months, I have been buying a lot more of them and switching them out to go with what I'm wearing for the day. As much as I love a good quality bag, at the rate I've been switching them out lately I've been looking at some more budget friendly options. 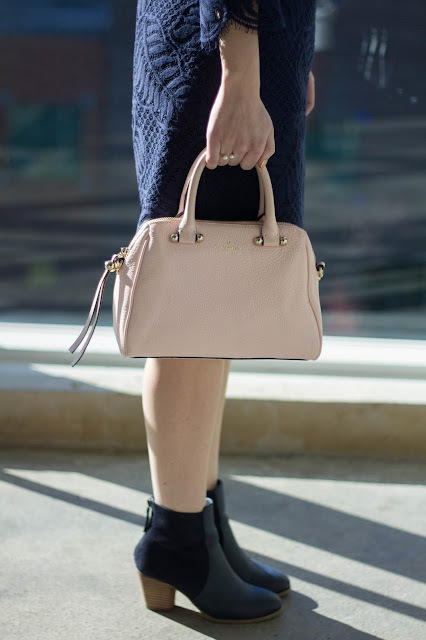 I would definitely invest in the lower range "splurge" bags in classic styles like this one from Gigi New York and this one from Rebecca Minkoff because I know they would be high quality, and aren't really trendy. 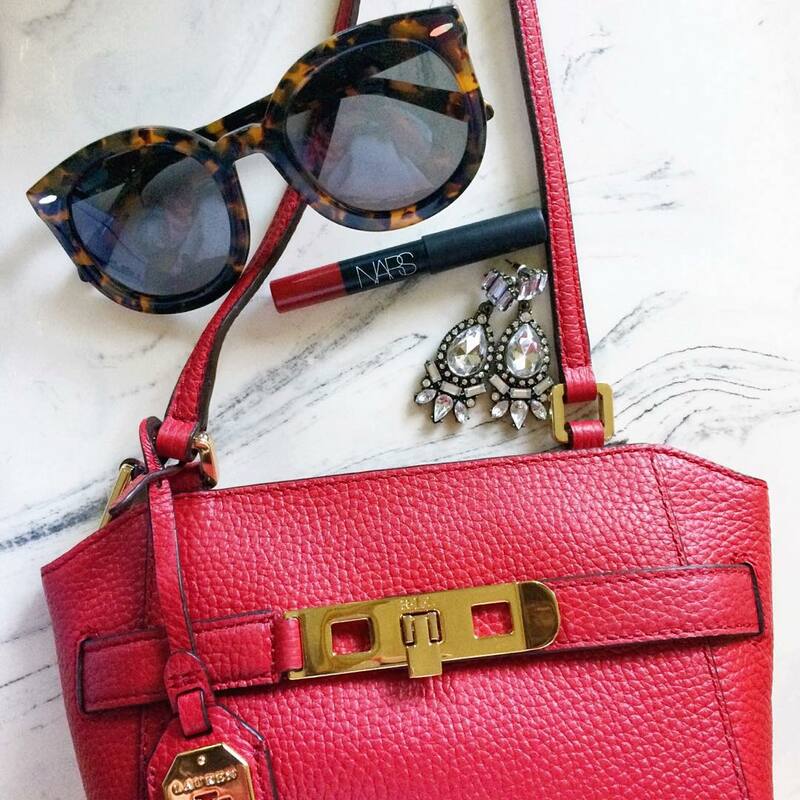 But, I don't think I could ever justify spending near or more than $1,000 on a handbag. 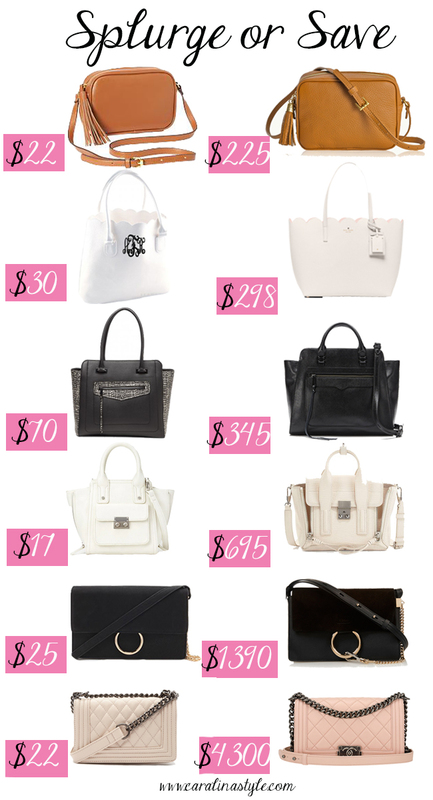 So, here are some very affordable look-a-likes to more expensive bags ranging from mid-level to luxury that I've been seeing around lately! Today I'm winter-izing a Lilly Pulitzer dress that I wore to my birthday dinner a few weeks ago. I got this dress as one of my birthday presents from the Lilly Pulitzer After Party Sale that I posted about here. 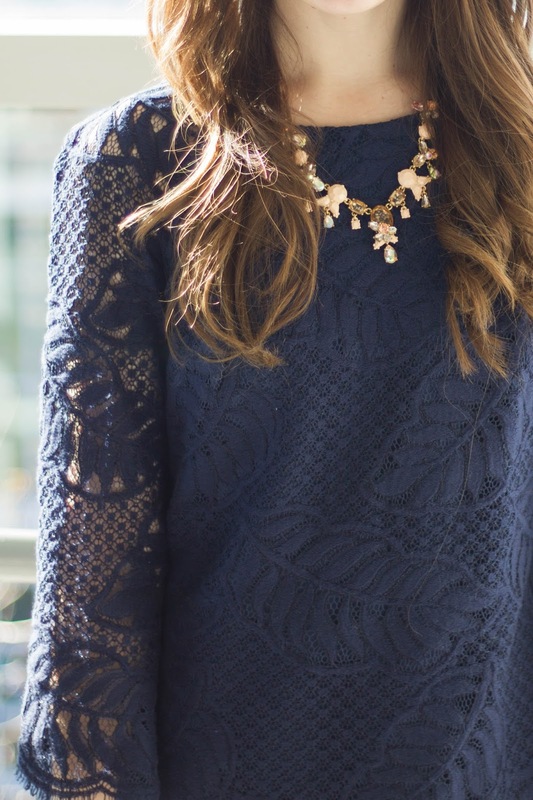 I've always loved their lace dresses, and of course I also love navy! I wear my Lilly dresses all the time in the summer, but I usually put most of them away once fall starts. 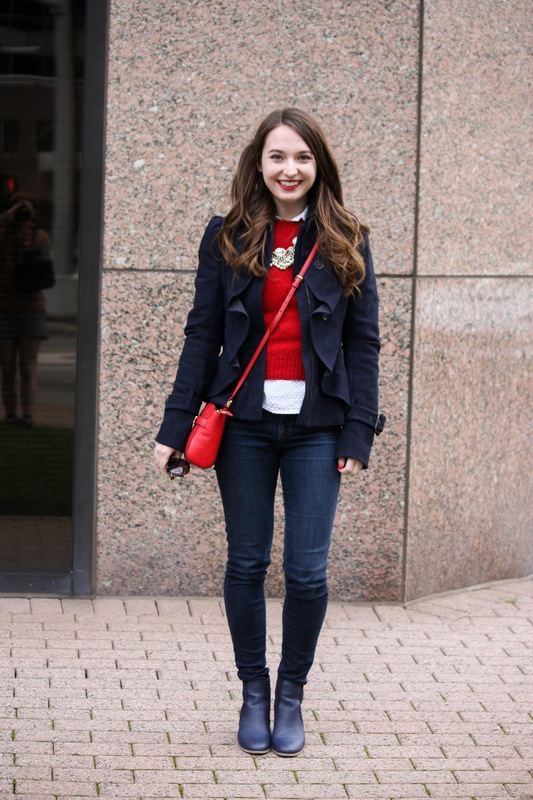 I don't remember which season this one came from in the past year, but I think it's easily adaptable for winter. Especially since it has been so warm until the last few weeks. And if you follow my blog Twitter I did some online shopping while I was recovering from my wisdom teeth surgery on pain meds last week, or #caraonlineshopsonpainmeds, and this coat was the result of that. I thought it was so pretty when I first saw it a few months ago, and when it was on sale for $50 (marked down from $248) I couldn't resist it! 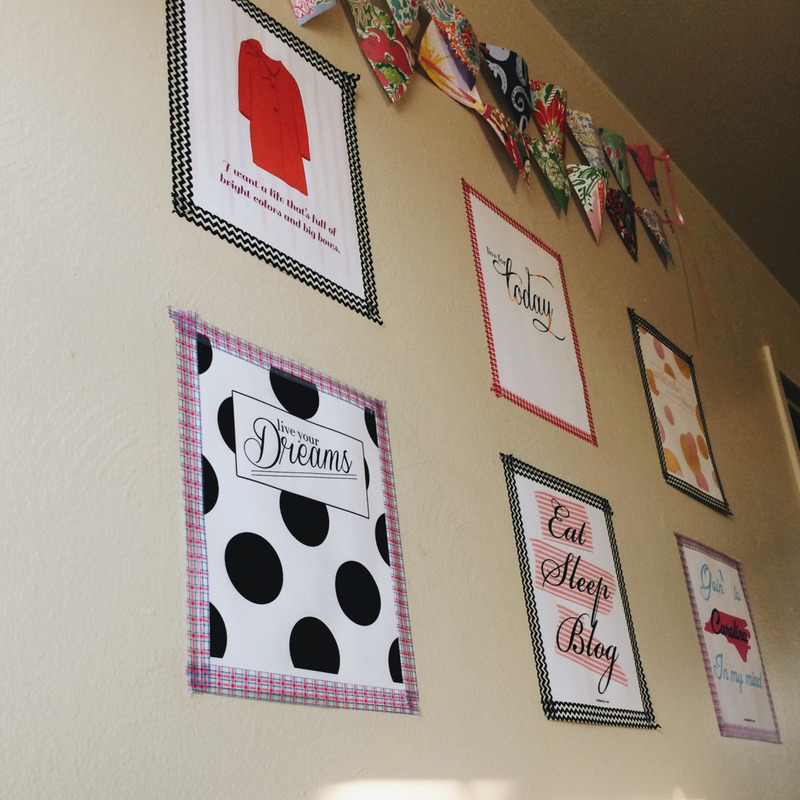 Getting a little personal in today's post, if you're very new to the blog, I recently graduated a semester early from Mercyhurst University in Erie, Pennsylvania. 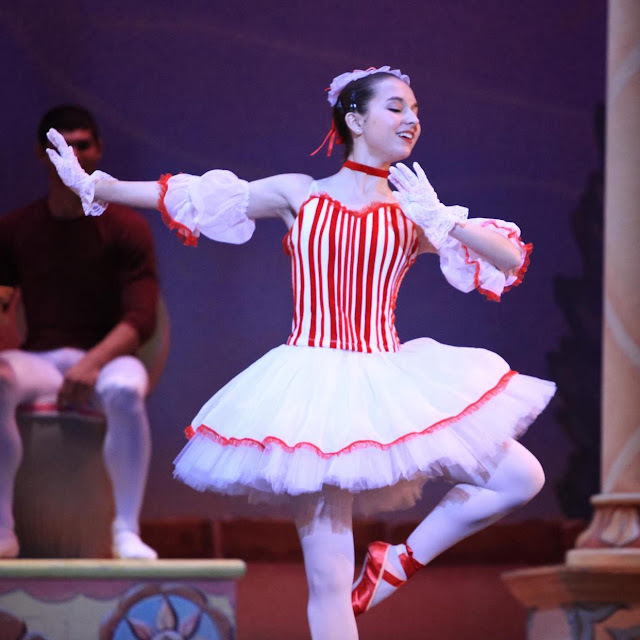 I originally left home in North Carolina to go to Mercyhurst for their ballet based dance program. And of course, I learned so much in class over the three and a half years. But, I learned a few things that I don't think I would have learned if I went to a state school in North Carolina. I'm not saying there is anything wrong with staying close to home, my second choice was the University of North Carolina at Charlotte. I just think there are some extra life lessons one can learn when they go away for college. Now, none of these are super positive experiences, I mean you don't say you "learned something the hard way" for nothing. But, they are just some opportunities I had to grow up, gain some independence, and learn something that can't be taught in a classroom. As I just mentioned, one of the main reasons I went to Mercyhurst was for the dance program. When I was a senior in high school I first looked at schools that had dance programs before I started applications. I also applied to several state schools as backups, and I did plan on double majoring if I did choose a school for the dance program. I knew going in that if I had a dance career, it wouldn't last for very long anyway and I would dance in small company. The dancers that have the real careers in big companies are ready to go at 17 or 18 and either go to college later, or not at all. I thought the next four years would be training for a dance career in one of those small companies, and I would have another degree for when I was ready to put away my pointe shoes. I just wanted to dance for as long as I could, because I loved it more than anything. My original plan was to double major in Dance and Business at Mercyhurst. We had a trimester system my freshman year, and by the end of the first term I realized that wasn't a very good plan. I had 6 classes that term, and only one of them wasn't dance related. I was really overwhelmed by that, and the thing that used to make me the happiest just stressed me out. I quickly lost the passion that I had in high school once I was graded in my dance classes. I ended up worrying so much about my GPA when it was based on my physical ability. I still love the art form so much, I just came to terms that a performing career was not realistic, despite how I sure I was, that it was what I wanted months before. I always thought that I wouldn't care that I wouldn't make any money as a dancer and may have to work extra jobs to get by, I just wanted to dance. But after just a few months, as I was loving college in general, I just lost the joy that I could always count on ballet to bring. I kept up with the major through my freshman year with the intention of dropping to a dance minor for the second half of the year. And by the end of the year, I got an injury in my spine. I performed three times my freshman year: in a community production of The Nutcracker, where I first realized being on stage was not what it used to be; in a Mercyhurst Dance Department performance in February that I so conveniently got a case of strep throat the day before the first performance; and in May with the Dance Department again, right when my back injury was at its worst. So I thought that was God's way of telling me to change my career path. If I didn't go to Mercyhurst, I would have put dance to rest. Except for a few classes here and there when I could fit them in. And I think I would have missed it so much and always wondered what would have happened if I pursued it in college. So even though it wasn't the best artistic experience, I do not regret it at all. I made some of the most amazing friends in that dance department (including my very best friend, love you Hannah!) and since I changed my major to Arts Management I still would absolutely love to work on the administrative side of a dance company. Which I am doing right now, even though it's just part time at the moment. The Mercyhurst campus was about exactly 8 hours away from home. It isn't too terribly far, especially compared to all of the people I knew there who were from the west coast, and different countries. But, its still by no means a quick trip. My parents would drive me up at the beginning of the year, I would fly home for: fall break (sometimes), Thanksgiving break, Christmas break, and Spring break, and then we would drive back at the end of the year. Even though I went home for just about every break, I always stayed there for long weekends, Easter, and the short break between J Term (1 class for 3 weeks in January) and Spring semester. I never had the option to go home just when I wanted to, or have my parents come visit me spontaneously, and I think it helped me grow up a little bit. I'm not saying it's bad to have that kind of option, there were plenty of times I wish I could have just gone home for a good meal, or have my mom help me when I was sick. But I learned how to deal with these kinds of things on my own instead, that would not have happened if I didn't go to Mercyhurst. It's no secret that North Carolina never really gets any snow, or has much of a winter in general. I think I read once that our average winter temperature is something like 48 degrees and our average snowfall is like 3 inches. 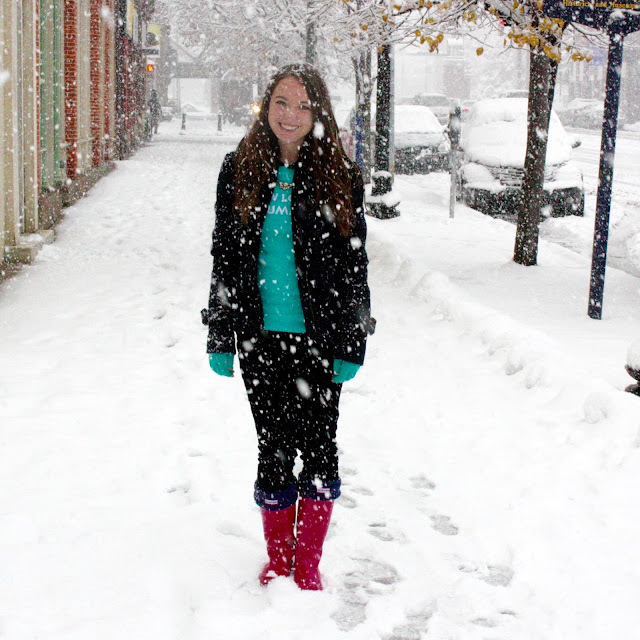 Erie, Pennsylvania usually gets about 100 inches of lake effect snow per year (it was the snowiest city in America for 2014, my sophomore year), and rarely gets above 30 degrees for most of the winter. The winter is also much longer there, all things that were pretty new to me. I can't say I really enjoyed any of this. I learned how to drive in the snow (in about 10 inches of snow for the first time), how to take care of my little car/dig it out of the snow, how to dress to trudge my way through several feet of snow to class (that was never cancelled) in the morning, and even running around in the dark when you're a dumb freshman and don't want to bring a coat to a party. Luckily, the beautiful Mercyhurst campus is quite small, and always lived on campus, so I never had to walk very far in the cold and snow. I'm sure it isn't nearly as dramatic for most people that move to cold places, it was just something I never adjusted to. Would I have been a lot more comfortable, and probably happier in the winter if I never left North Carolina? Of course! But, it made me really appreciate where I was from. And I never would have experienced how it feels to experience a new climate, or understand when people think southerners are ridiculous when it comes to snow, I mean we got like 3 inches of snow this weekend and everything has been shut down for days. Granted, we also got lots of ice, and not much of it has been plowed because we just aren't equipped for it, because we don't really have the need to be. I also learned that I just don't belong in that part of the country. And as much fun as I had in college, and as much I miss it so much already, I'm so happy I graduated early and I'm not dealing with all of that cold right now. As I said in the second lesson I learned outside of the classroom I flew home several times a year during college. I even made a little guide for the blog about it last year actually. I basically always had some flight issues on these trips, mostly because I usually flew from one small airport to another. From missing connections, having flights turn back around, cancellations from weather, and being stranded overnight, I basically saw it all. My parents have been calling me the "seasoned traveler" since the first few of these events. Again, not really positive experiences here in these life lessons. 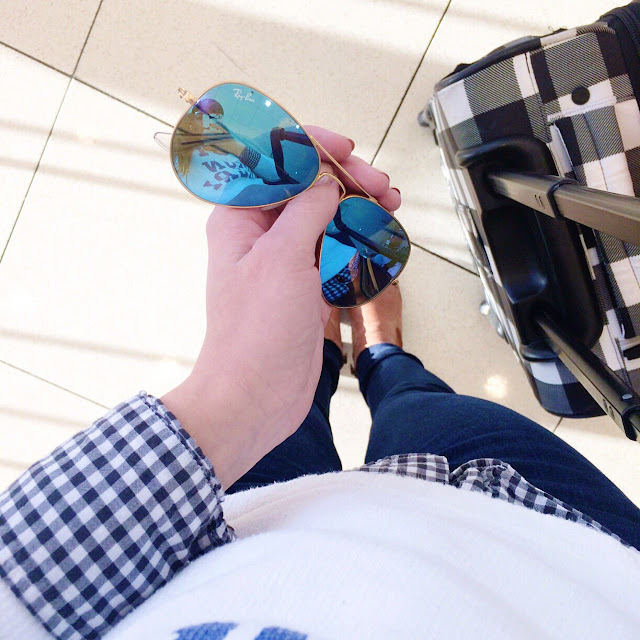 But, having been alone for almost all of these trips, I learned how to figure it out on my own. Well, usually with some help from my parents on the phone, but still. Another little opportunity to grow up, and gain some independence. Now I know how to stay calm when air travel goes wrong, instead of melt into a mess of tears like I usually did on these occasions. And now if I ever have to travel for business, or just the next time I go on a plane, I will know how to handle some of these situations much better than I probably would have four years ago. It probably seems like I had an awful time in college from this post, but I really didn't! I loved it so much and these were just some things that happened that I learned from, no entire experience can be perfect. I've talked more about my whole college experience here that I wrote just a few days after I graduated. I was so emotional my last few days up there, and I miss it so much, even though I've only been gone for about six weeks. I even teared up a little while writing this post because it has only really been setting in the last week or so, that I'm all done with college. Especially now that Christmas break has ended and my friends are all back on campus. While I'm still at home sending out resumes for a full time job everyday. But, since we didn't have a fall semester graduation ceremony, I'm counting down the days to go back up to Mercyhurst and walk with my friends! However, I still don't regret graduating early. Its so nice to be out of the never ending Erie snow, and closer to my family and boyfriend. I think I would be so ready to be done if I was still there, fall semester was always more fun for me. I would probably be so ready to get out, and not enjoying the time I had left. But since I left early, I really appreciated my last semester. And it feels so great to not have to think about writing a paper or studying for a test! Anyway, anyone else who went far away for college learn any lessons like these? 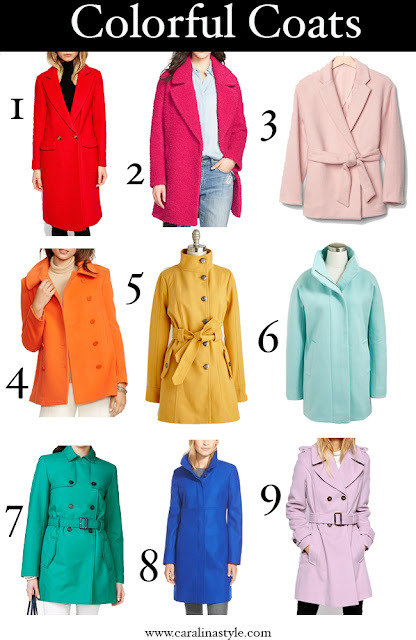 I don't think it would a surprise to anyone if I said I love a colorful coat. I have this green one, this pink one, and I may have just ordered this blue tweed one! 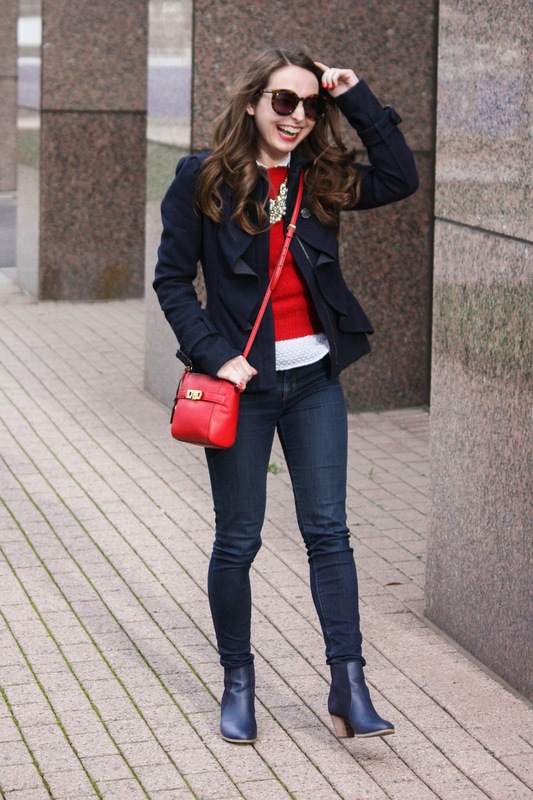 As we all know I love bright colors in general, so I think colorful coats are a perfect way to add quite a bit of color to a mostly dark winter outfit. Now that we're actually getting some winter weather (even though I really miss how nice December was) what's a better time to share them? So here is a spectrum of some of my recent favorite coats! It's been awhile since I've done an Insta Lately and I'm back at work after my wisdom teeth surgery. So here are some snaps from Instagram with links included, follow along if you aren't already: @cara_194! When it was 70 degrees in December, I'm really missing that right about now! Found these flats on sale, got Clemson colored macarons for New Year's Eve and the orange bowl, and I found these Current/Elliott jeans for only $20 in store at Sak's Off 5th! 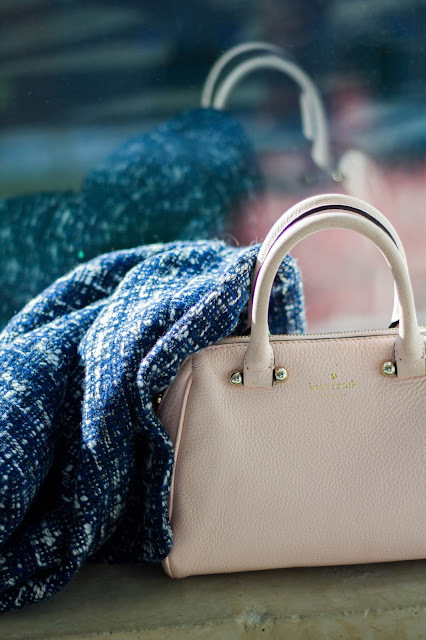 I also visited the Kate Spade store the day before New Year's and I'm so obsessed with these bags, especially this one! My dress from the Lilly Pulitzer After Party Sale arrived that I bought for graduation, I can't wait wear it! My latest Rocksbox, use code "caralinastylexoxo" for your first month free! I got my wisdom teeth taken out last Wednesday. So when I finally left the house again after sitting around for almost 5 days, I wanted to have some fun accessories, and this is what they were! I was inspired to write this post because someone on Tumblr recently put a message in my ask box saying "Your skin looks great!!! What do you use?" And I answered as I usually do for those types of questions with a list of the products I use. But, that kind of surprised me that someone would think to ask me that. Because I have struggled with acne since high school. Like most teenagers, it probably started in about eighth grade. And it reached it's worst point during my junior year of high school. I still deal with it today at age 22, so I can't say I entirely "fixed" my acne, but I definitely decreased it. So I thought I would use this post to share my skin story, and I'm listing some of the products I have used that have helped me along the way. Sophomore year: I think January 2010, this is a super bright photo, but there was some acne there, and braces that I liked to hide. The worst it ever was: I think March of 2011, about halfway through junior year. I think within a week or so of these photos being taken, my mom and I thought it was a good idea to seek help from a dermatologist. So the short answer to the question "How did you clear your acne?" is I went to the dermatologist and she prescribed me with exactly what I needed. About a year or so before my skin reached the worst point, I used lots of different scrubs, face washes, spot treatments, etc. that said they were supposed to help with acne, but I never really saw any results. I think it got as bad as it did for a number of reasons: besides the fact that it just happens to most people in high school and a lot of people in my family had also had acne issues. Once it started getting bad, I used a lot of oily makeup in attempt to cover it up, and I was in ballet 20+ hours a week and I sweat a lot around my face. My hair was also really greasy and when it wasn't up for dance, it was all in my face, I had an awful diet (I still kinda do), and was not getting enough sleep. My solution ended up being prescription Epiduo topical gel and the antibiotic Minocycline. I'm not saying this is the perfect fix, and that if you have acne that you need prescriptions. And this post is not sponsored, I'm just saying this was my skin solution. I know a lot of people who saw the same results from just a good cleanser, or even need other harsh prescriptions like Accutane. Through college it worked the same as it did in high school, but it wasn't keeping my skin quite as clear as it used to. So about 6 months ago I added a second topical gel, Aczone which has also worked so well for me! I never really experienced any bad side effects from any of these medication except for when I started on them my skin dried out a lot, which I was told it would. I had to go put lotion on my face in between classes it was so flaky, dry. But after about 6 or 8 weeks, I started seeing some major improvements. I also cut out all products that weren't oil-free including moisturizer, foundation, and concealer. My dermatologist also recommended to avoid any products that were grainy, I don't really remember why it's bad for acne, but it helped! So in conclusion, acne hasn't really been much of an issue for me since I was about 18, but I definitely still get the occasional breakout! So along with the prescriptions: here are some of the acne friendly products I have used that have improved my skin within the last few years. 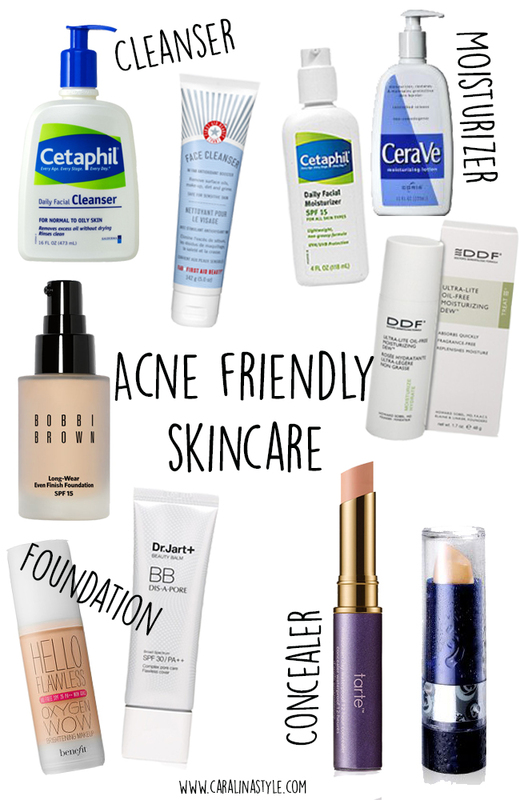 So if any of my readers are struggling with acne, I would recommend using these oil-free products to help deal with it, maybe before you look into taking acne prescriptions. Again, I'm not saying they are the perfect solution, they are just what have worked for me, and I hope could help you too! There's also plenty of little things that help with acne too like don't touch your face a lot, shower with water that isn't too hot, don't pop your zits, try not to have your hair on your face, change your pillowcases often, and drink a lot of water! 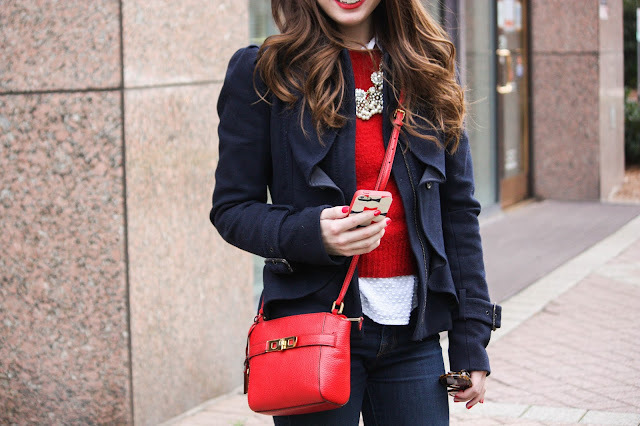 Ever since the holiday season I've been really loving red. And what betters colors to pair it with than white and navy, that I wear most of the time anyway? 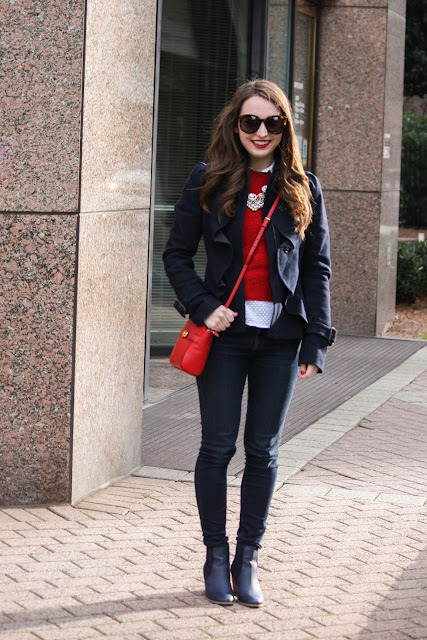 So I'm feeling a little patriotic in January with this outfit. I got this bag and these boots for my birthday last Friday and I've been wearing both non-stop since then! Well since yesterday, I had these photos taken the day before I got my wisdom teeth taken out yesterday morning. So now it's just lots of Netflix (I already finished Making a Murderer), meds, ice, soup, scrambled eggs, mashed potatoes, and sorbet. Shoutout to my mom for being an awesome caretaker and bringing me all of these things, I've barely left my bed since then! New Year, New Blog Design?